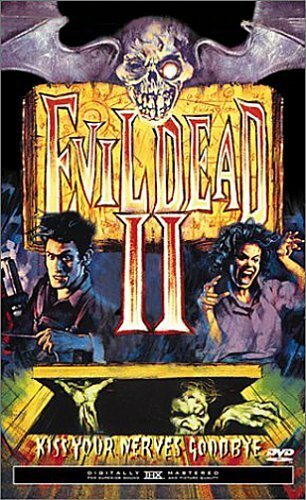 The last of the Evil Dead films is here to review now, for a long time Evil Dead II was my favourite of the original trilogy but later got over taken by The Evil Dead's black humour. For the longest time I assumed this was a remake of that first film, it is shockingly only recently I discovered it was not and that the film after the first 10 minutes is a continuation of the events of that one. The only survivor of a night of terror in which he had to kill his demon possessed friends Ash finds himself the new target of the Evil Dead. Dawn brings release from the terror but spending much of it unconscious it is soon night time again when the evil returns in force. Meanwhile the Professor's (whose recordings unleashed the terror) daughter has arrived back in America and is enroute to her familys cabin along with some missing pages of the Necronomicon, and a small group of helpers. Can the Evil Dead actually be stopped? Evil Dead II looses a lot of the atmosphere that made The Evil Dead such a feat of endurance (well, for me watching it for the first time), it replaces it with slapstick, funny one liners, and even more over the top gore than before, here the blood runs red, green and blue! 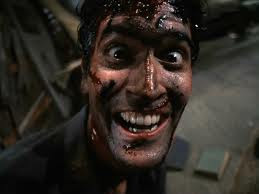 Bruce Campbell really brings Ash to life as the self obsessed, arrogant heroic idiot, a joy to witness. Half the film is Campbells gurning face and slapstick fights, two in particular spring to mind; his fight against his girlfriends severed head clamped to his hand, and the iconic cult battle between him and his possesed hand, both of which Campbell does a laugh out loud performance. The other half of the film are the demons and the effects done for these. Somehow the special effects don't seem as good this time around. The stop motion dancing girlfriend scene looks really rough, but this just adds to the charm for a film that does not take itself seriously, the monster transformations again look rough but again just perfectly fit this film. 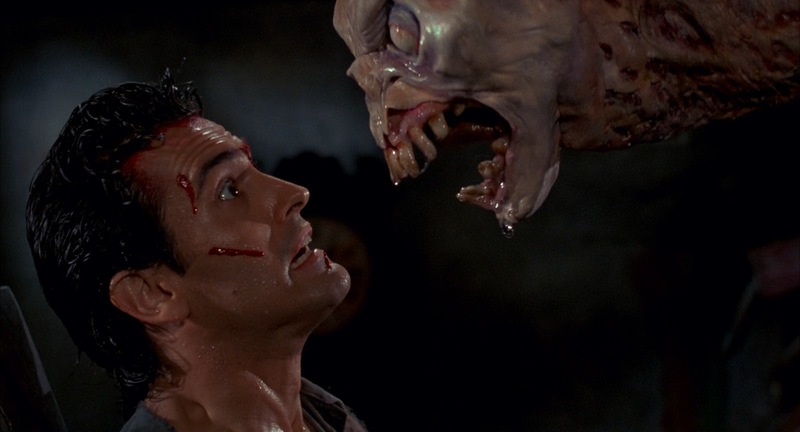 Evil Dead II works because of the comedy, plain and simple, the best parts of the film revolve around this. The scene that always gets me laughing my head off is when every object in the cabin starts laughing at Ash; books, chairs, a deer head on the wall, even a table lamp, in his madness Ash joins in, such a funny scene that ends Ash's alone chapter and ushers in more characters to be possessed and killed in entertaining ways. The horror aspects work well when they do appear, the scene where Ash is locked in the cellar is memorable, and the whole end sequence with the cabin under massive attack work well. The Deadites look more like monsters this time around rather than human, changing into hidious forms and being more gooey and icky such as when redneck girl Bobby-Joe accidentally swallows a demon's eyeball! Sam Raimi again does a fantastic job of directing bringing yet more unique and crazy camera angles that have influenced many films since (e.g: Edgar Wrights ones). My reviews have been lacking lately, I blame a darn sinus infection that is giving my face constant pain, but there you go, my review of one of my favourite films of all time. If you haven't seen the original Evil Dead trilogy then it is something you have to do now!